Why do certain paintings win art competitions? The answer lies a lot in the harmonious arrangement of black, white, and gray in the painting. A synthetic arrangement of dark and light creates an impression of beauty, regardless of either the colors used or of the subject matter. This is called ‘notan’ from the Japanese word that means dark/light harmony. In order to understand notan, you first have to understand values. Take a look at this video if you want to know what values are. Step 1 – Do a series of Notan paintings using grey and black pens to get an idea for the dark and light shapes in your composition. Step 2 – Analyze your black and white notan studies and pick the design you think has the best composition. 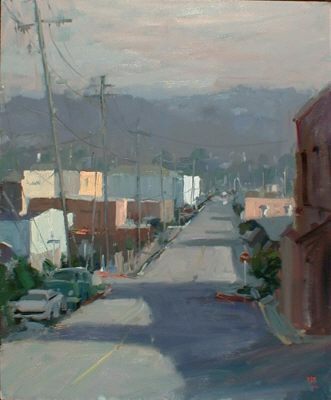 Step 3 – Here is the final notan study for one of Barry’s paintings that won an award in a plein air competition many years ago. If you look at the final painting and a black and white version of it, you can see that the small notan sketch captured the essence of its dark light harmony. Squint at your subject and try to assign all the shapes you see to two, three or four values. The number of values you actually see will, of course, be huge, but it is important to assign each shape to the nearest one of these values. To learn more about detailed notan design principles, see the notan lessons in the painting classes A, B, C of the Virtual Art Academy Apprentice Program Year One. and painting class E in Year Two.